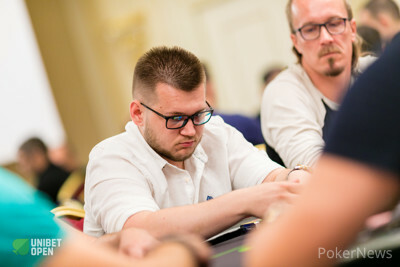 Andrei Tudose opened to 18,000 from the cutoff before Ionut Decher three-bet to 55,000 from the button. The action folded back to Tudose who four-bet jammed for about 220,000. Decher, who had his opponent covered, went into the tank for several minutes and appeared to be counting off some chips. Eventually Decher decided to fold and Tudose got a big boost to his stack without seeing a flop.